though it was announced a long time back by snitchseeker.com.. 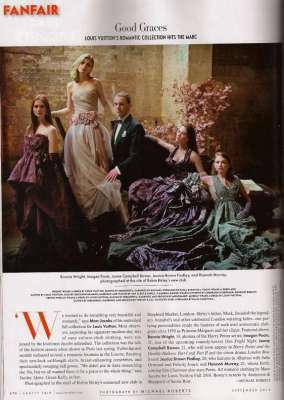 But it still surprised me, partly coz i had never expected it to be from the september issue, i guess.. Well Harry Potter actors Bonnie Wright and Jamie Campbell Bower were featured in the September style issue of Vanity Fair. The feature has been released, where Bonnie, along with fellow young British actors Imogen Boots, Hannah Murray, and Jessica Brown-Findlay, posed in Marc Jacobs fall fashion line for Louis Vuitton in London; Jamie wore a tuxedo Anderson & Sheppard for Saville Row.